2002 Dodge Caravan PCM ECM ECU Engine Computer "LIFETIME WARRANTY"
Covers all listed engine sizes. Limited Lifetime Warranty w/ Core Exchange. Flashed with latest Mopar calibration. VIN Specific Programming (Plug & Drive). INSTALLATION: Disconnect the battery & replace the module. No hassle! It's really that easy! There is no additional programming/flashing required! IMPORTANT: These modules are for U.S. & Canada vehicles only. Listing is for U.S. & Canada emissions only. 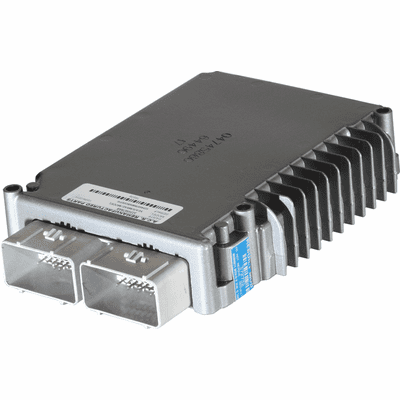 Please provide VIN & Mileage (Part# if avail) during checkout to ensure proper programming of your module. All Items undergo remanufacturing, vehicle specific programming and testing on a per order basis. Processing time is 1-3 Full business days (Mon-Fri, excluding Holidays). Orders received after 2pm EST will begin processing the following business day. Parts are shipped in the order they are received with the shipping service selected during checkout. Tracking information will be sent via email at the time of shipment readiness. We accept returns as long as the part is in its original condition. Returns must be mailed within 14 calendar days from original delivery. All approved returns will be initiated in the form of a refund to the original form of payment. There will be a 20% restocking fee to cover vehicle specific programming & testing and all shipping charges will be deducted. (Free shipping charges are a $12.50 each). Refund deposits take 4-6 business days. Full refund will be issued for cancellations prior to shipment only. We offer a standard Lifetime warranty on all computers purchased through this site. 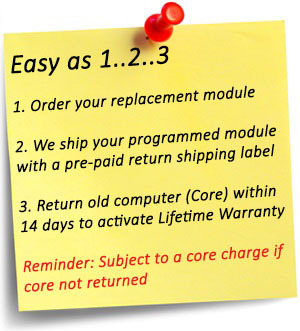 Some listings require your core to be returned to activate said warranty within 14 days whereas a return label will be provided. Failure to return the core if required will result in loss of warranty and you will be subject to a core charge. All units are fully tested for functionality prior to shipment.